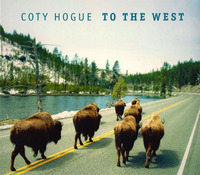 Thanks to Hearth Music for sending me the new record from rising star Coty Hogue of Bellingham, WA. Her new release To the West charted #1 on the Folk-DJ chart in June, for good reason. Coty Hogue sings a lovely, sultry blend of old-time Americana and contemporary songs that connect to the old strain. Her strong, clear voice is certainly the finest example of the American folk tradition right now. Recommended!